This post contains a travel guide about the best things to do in Kashan Iran. Kashan was the first desert city on my Iran trip. When I checked in at my hotel there were dark brownish clouds gathered in the sky. In a short time I could hardly see anything in front of me and sand collected everywhere. I experienced my first sand storm. The best thing to do was wait in my room till it was over. When the sandstorm finally blew away it was already 7 PM, but in Iran this is actually when the streets are getting lively again. In the morning the bazaars only open around 10 AM till midday prayers and then close again till 5 or 6 pm. It is in the evening when most people go out. Even after two weeks in Iran I can’t get enough of wandering through the colourful bazaars and Kashan is particularly beautiful with hidden tilework, mosques and old buildings. Kashan was the first town that felt touristic to me. Tourism is increasing in Iran and Kashan is now a popular town on the tourist trail. Less known than Esfahan, Shiraz or Yazd, it still attracts a fair share of travellers. Therefore hotels were full and I was no longer the only tourist in town. I included Kashan for the traditional homes it is famous for. For the first time I saw souvenir shops where tourgroups wandered around following their tour leaders. The further you get from the traditional houses into the small streets of Kashan’s old town, the less tourists you will encounter. For me the real beauty of Kashan was in these narrow backstreets. Right opposite Ehsan house is the Agha Bozorg mosque. A beautiful mosque with symmetrical designs. Worth visiting both during the day and at night. In the courtyard below is a functioning madrassah. Kashan had one of the most beautiful bazaars I have seen in Iran. It’s an intricate maze of alleys with hidden mosques and tea houses. The highlights are the beautiful domes in the ceilings where I enjoyed a cup of tea in a traditional teahouse. In the north is the lush Fin garden. As it turned out this was also the destination for many school tours. I was followed by a big group of giggling 10-year-old school boys . Sometimes one boy was brave enough to shout to me: “hello, how are you?”. At some point I decided to turn around and actually talk to them. Now they got really excited. They were from Esfahan and all wanted a selfie with me and then wanted to shake my hand as well. Their teacher got immediately nervous and after two lucky boys they were sent away and the teacher kept apologizing to me that the boys were bothering me and were not allowed to shake hands with me. Kashan is also famous for the production of rosewater. Near Fin garden and the Tabatabei house you can visit a rose-water factory where the rose-water is produced. The entrance is free and there is no pressure to buy, but if you want to buy rosewater this is the place. This small shrine hidden in a backstreet on the way to Fin garden gets few visitors. An interesting quiet stop without the crowds of tourists. Wandering through the small streets of the old town is wonderful. If you look careful at the doors, you can see many have two knockers. One was for man visitors and the other for woman. The narrow streets offer many picture perfect scenes. The best time to take a walk is in the afternoon when the sun starts to set down. Kashan has several traditional houses that have opened their doors for visitors. They are now a major tourist attraction and definitely worth a visit. My most favourite was Borujerdi house where I met another group of schoolgirls. They were just as curious about me as the boys I met earlier that day and again there was a lot of staring and giggling until a brave student finally managed to ask me some questions. The Tabatabei house is also very beautiful and in the Abbasi home is a traditional teahouse serving delicious food. The Sultan Mir Ahmad hammam should not be missed. The inside is very beautiful and it will take your breath away. Ask if you can visit the roof for a nice view on the hammam’s domes, the old town and the interesting tower of Borujerdi house. It should be included in your ticket price, but most likely they will ask for a tip to open the door to the rooftop. Another small local shrine worth a visit if you are in the area of the traditional homes. It is right next to the Tabatabei house. My last evening I spent in a park behind the old city walls watching the sun set. Almost every town in Iran has one or more parks where families and young couples go to hang out. A picnic blanket and a thermos of tea is all they need to enjoy the evening. Two sisters with their 3 little boys gave me a hot chocolate and a group of curious young girls started to ask me questions. One of them reprimanded me for the amount of hair that was peeking out from my scarf. She started to put my scarf right while her friends were laughing. At first she also did not want her picture taken, but her friends were so excited that in the last moment she joined. She ended up with the biggest most generous smile. One popular day trip from Kashan is to visit Abyaneh, a traditional village in the mountains. We left early and the road to the village was scenic. Just as I taught that I would try to make some pictures of these beautiful mountains our driver got nervous. He informed us we can not take pictures. We were in the middle of nowhere surrounded by desert and mountains. Our driver could not speak English, so all he could tell us was: “no pictures, atom bomb, radar”. We were close to one of Iran’s uranium enrichment plants in Natanz. After a few miles I could indeed see some buildings far away on the horizon. We arrived early in Abyaneh and everything was still closed. The good thing about this was that we were there before the tour buses arrived and could enjoy the town in peace and quiet. I was wondering tough how many people actually still lived here. The small village of red mud houses looked abandoned, except for a few souvenir shops. Our guide explained that the young people all leave the village for the luxuries of bigger cities like Kashan or Tehran. The older generation still lives here tough, and they keep the traditions alive. The women still wear the typical white chadors with a design of roses on them, men can be seen on their donkeys and bakeries are making fresh bread from the oven. Just as we were about to leave the old ladies started to open up their souvenir shops and the buses started to arrive full of local and foreign tourists. Another possible daytrip from Kashan is to the religious town of Qom and the shrine of Fatemeh Massumeh. 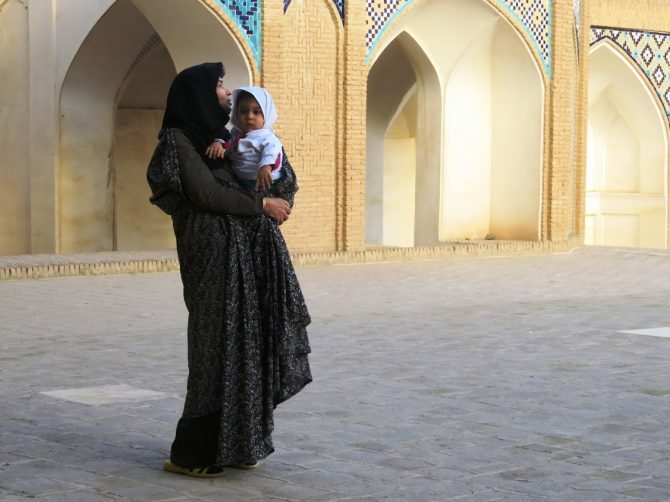 Read more about my visit to Qom in my post: Qom, the religious face of Iran. Ehsan House: Very good hotel with a delicious breakfast buffet included. The prices are very reasonable for backpackers with a dormitory for 500,000 rials. It is best to make a reservation, especially for double rooms. When I was there the hotel was full. How to get to Kashan? Kashan: There are frequent buses to and from Tehran (4 hours), Qom (2 hours), Esfahan (4 hours), Shiraz (10 hours)& Yazd (5 hours). The main bus terminal is at the northern edge of the city, but if you are going to Tehran there is no need to go all the way there. You can catch a bus to Tehran at Montazeri square. Coming from Tehran this is also a convenient place to get out and catch a taxi into town. Abyaneh: There is no public transport going to Abyaneh. In Kashan they offer tours to Abyaneh for about $15 dollar. It is also possible to ask your hotel to organize a taxi and maybe share the costs with other tourists. Qom: There are frequent buses from Montazeri square to Qom (less than 2 hours).